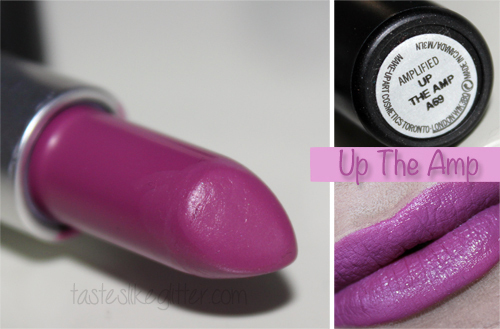 Up The Amp is a lipstick that's been in my collection for quite sometime now but it seems to get overshadowed by other shades. I'm on a mission this year to 'shop my stash' so I'm making use of things that generally don't get so much love. M.A.C describe this shade as as a lavender violet, though it definitely has a hint of pinkness to it whilst remaining cool toned. It's an amplified finish and I find with this shade especially, because it's quite deep in colour, application and payoff is a breeze. It's full coverage whilst remaining light and creamy in texture, not at all drying on the lips. For me it's definitely more of a vampy shade. Because I usually go quite colourful on the eyes I tend to keep lips pink. I can definitely see this working with a thick winged eye and some matte neutrals on the eye. I could be wrong but this isn't a shade I find a lot of bloggers talking about but if you like purple lips or want to try them, this is perfect for easing you in or adding to your growing collection!